Ziel der Untersuchung war die Analyse des Einflusses der Korsettcompliance auf das Behandlungsergebnis bei idiopathischer Skoliose. Bei 90 Jugendlichen wurde mit Dresdner Skolioseorthese (DSO) ganztags behandelt. Nach einem Beobachtungszeitraum von im Mittel 4,3 Jahren erfolgte die retrospektive Analyse der Compliance mit Fragebogen und Gespräch. Die Primärkorrektur in Orthese betrug lumbal 36% und thorakal 25%. 59,4% der Patienten waren compliant und hatten damit eine Erfolgsrate von 89% (konstanter Winkel nach Cobb bzw. Verbesserung). Beim Zusammentreffen von Compliance und einer Primärkorrektur von >30% erreichten thorakale Skoliosen eine Korrektur um 8,3° und lumbale Skoliosen um 12,4°. In der Noncompliancegruppe wurden bei 11 von insgesamt 39 Patienten Operationsindikationen gestellt, während dies in der Compliancegruppe nur bei 4 von 57 Patienten der Fall war. 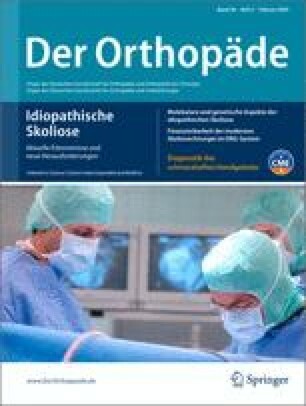 Die Compliance ist neben der Primärkorrektur der Orthese der entscheidende prädiktive Faktor der Korsettbehandlung idiopathischer Skoliosen. Es erhebt sich die Frage nach psychologischen Einflussfaktoren auf die Compliance. The purpose of this study was to assess the compliance of brace treatment and the correlation with outcomes in patients with idiopathic scoliosis. Ninety adolescent patients completed treatment with the Dresden scoliosis orthosis. After a mean follow-up time of 4.3 years, their level of compliance was retrospectively assessed and correlated with the radiographic results. The amount of primary correction was 36% in the lumbar spine and 25% in the thoracic spine. Of the patients, 59.4% were compliant (daily duration of brace treatment >20 h). The success rate in this group (improved or constant Cobb angles during therapy) was 89%. With good compliance and primary correction of more than 30%, the average Cobb angle at follow-up had improved by 8.3° in the thoracic spine and by 12.4° in the lumbar spine compared with the initial Cobb angle. Eleven of 39 patients in the noncompliant group but only four of 57 compliant patients underwent surgery. Compliance with orthosis therapy and the amount of primary correction are together the most important factors for predicting the final outcome of brace treatment in idiopathic scoliosis. Influencing factors on compliance must be further analyzed.